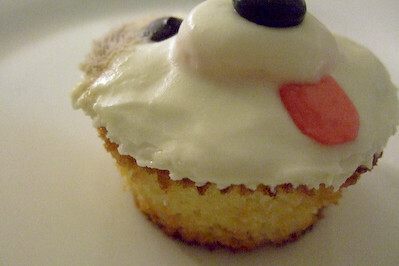 raspberri cupcakes: Cupcake Day for the RSPCA - Pupcakes! 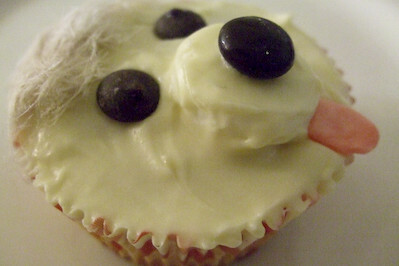 As mentioned previously, Monday 17th August 2009 is Cupcake Day for the RSPCA. I decided to participate thanks to a bit of gentle persuasion from a certain person. I love the idea of it, it's such a cute and fun way to raise money and everyone can get involved. So I quickly registered to be a cupcake cook on their website, and received a Cupcake Kit in the mail a couple days later with posters and balloooons! 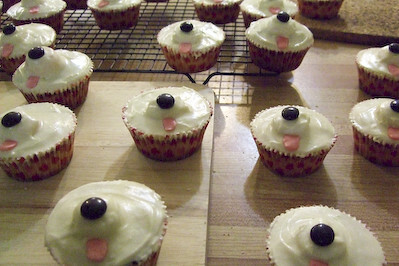 Since this was my first year participating, I had to go with the obvious cliche, animal cupcakes. 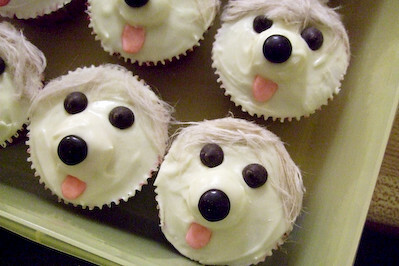 Someone jokingly mentioned "You should do pupcakes! ", and being the big cheesy person that I am, I just had to do it! Many ideas were explored, but I decided to keep it simple. Lemon cupcakes adapted from my foolproof cupcake recipe, with maple cream cheese icing (a huge hit on top of my sweet potato cake recently). The only extra bit of flair came from some persian fairy floss to make them a bit furry looking, an idea that came to me while enjoying dessert at the Gazebo Wine Garden, which included a fairy floss topped brownie. 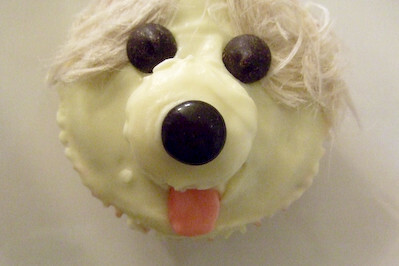 It was a bit fiddly, but each pupcake got its own unique hairstyle. This one looks like a bit of an Einstein don't you think? The thing that pleased me most was that these are really yummy, as well as looking super cute. A light, moist, crumbly cake with the heady scent of lemons and a smooth, rich icing with a hint of maple syrup. Hopefully everyone will think these make it worth forking out the money for a good cause! 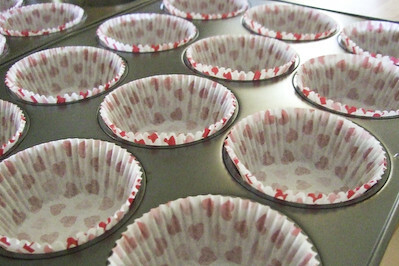 Preheat oven to 180C and line a cupcake tray with paper cases. Zest lemon and set aside the zest. Juice lemon and top up with mandarin juice (if necessary) to obtain 1/3 cup juice. Cream butter and sugar together using an electric beater until light and smooth. Add eggs at a time and beat in well. 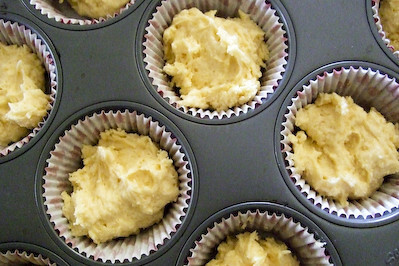 Add the juice, lemon zest and flour and quickly mix until combined, avoid overmixing the flour. Pour cake mixture in paper cases, filling them about half to two-thirds full. It's usually easiest to use a table spoon to scoop the batter and then drop it into your paper cases. 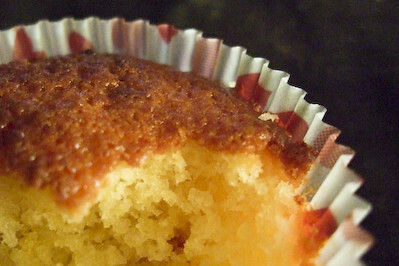 Bake for about 20 minutes, or until the tops are dark golden brown and cakes are thoroughly cooked through. Cool for a couple minutes in the tray then remove carefully and cool completely on a wire rack. When cakes are completely cooled (I baked them the night before), cut marshmallows in half for the noses of the pupcakes. 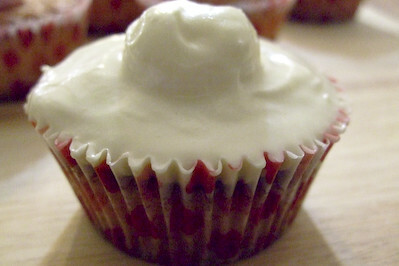 Place half a marshmallow on close to the centre of each cupcake. Beat the softened cream cheese in a large mixing bowl until smooth. Add the sifted icing sugar and beat until well combined. Add maple syrup and beat until combined. 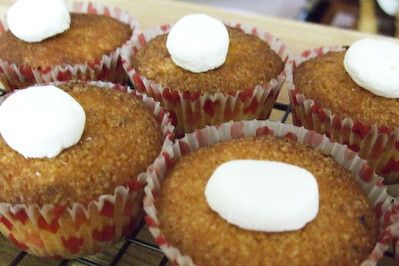 Use a small spatular or the back of a spoon to smooth the icing over the top of the cakes and over the marshmallow snouts. 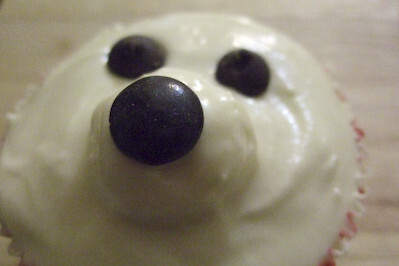 Place a brown m&m on the top of the centre of each icing-covered marshmallow to finish off the puppy nose. 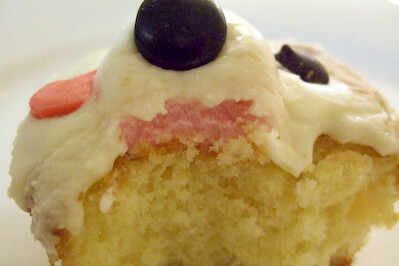 Use two chocolate chips for the eyes. Place a strawberry fruit chew between two sheets of baking paper and carefully flatten with a rolling pin to about a millimetre or so thick. 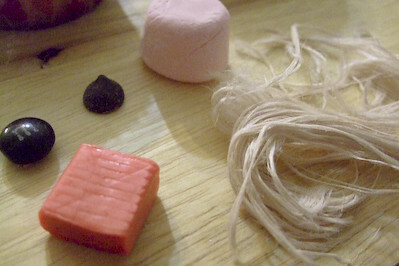 Cut into the shape of a tongue and place underneath their marshmallow snouts. Grab a tuft of persian fairy floss (can be bought from Persian grocery stores and the Essential Ingredient) and arrange above the eyes for the puppies hairdo. If you can't get this, you could also place half oreo cookies (to make ears) on the top of the cakes at the same time as the marshmallow and cover with icing. Voila! 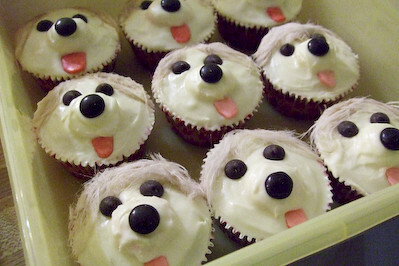 You have puppie cakes! Some may have some dodgy haircuts, but oh well...they're pretty cute aren't they? Pupcakes waiting for their eyes and hair...a bit creepy, no? I'm a bit buggered since this took a lot longer than I thought it would. Me & my kitchen are covered in icing sugar and fairy floss but I think it was worth the effort! So tomorrow I will be hauling these little pups into work, in an attempt to sell them to my poor workmates who have become quite used to getting my baked good for free! The only thing I can't decide is how much to charge for them. What do you reckon? 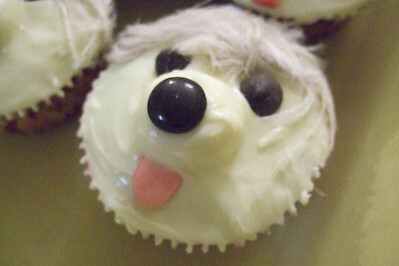 P.S If you like my pupcakes, click HERE to vote for it for the Creative Cupcake competition on the RSPCA website! These are so cute! The amount of effort that you put in to make these is phenominal! Those are going to sell like cu- well, some other sort of cakes. You should jack up the price on these ones cause I'm sure people will pay to get their hands on one of these! THIS IS THE COOLEST THING EVER!!!! Pro skills Steph! OMG STEPH you crazy woman baking baking bakingggg ^_^ you one genius!!!! These are absolutely adorable! how could anyone eat one of these theyre wayyyyy to cute! Ive always wondered what the persian fairyfloss would taste like? it has a real wig looking texture i assume its thicker than the usual fairyfloss and i imagine it would melt as easily on the tongue? Oh my god you did it...complete with the Persian Fairy Floss!! 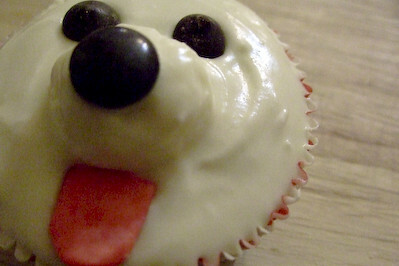 These Pupcakes are to die for! Save me one for Tuesday pretty please? Hehehe (nah seriously I'll pay for one!). OMG these are incredible! You did such a great job! I love the little tongue sticking out, but the fairy floss just makes it perfect. You are a baking pioneer! These are adorable!!! I love the hair on top of their cute faces! Those are unbelievably cute! Well done Steph! OMG !!! This is so so so so so cute ! You are genius ! Ahhh OMG! So cute Steph! These are just way too adorable. Looks like all that effort paid off! You should charge at ALOT for these, plus they're for a great cause! Congrats girlie!! 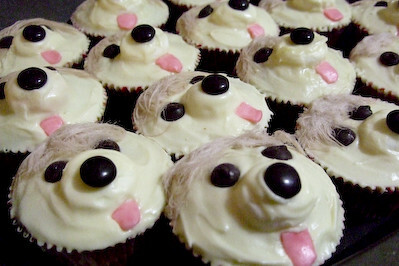 I've been trying to work out the breed of pup that the cakes remind me of: Maltese, Shihtzu, Benji? They're so wretchedly adorable that you wouldn't want to eat them! Hope you sell lots. these look AWESOME, I love the hair and tongue! Wooo awesome cupcakes! Too cute to eaaaat! Oh, how friggin cute do these look?! :) You did a fantastic job with your decoration, the tongue and persian fairy floss totally completed the look! That's so cute! Love how you got the noses to stand out by using marshmallows - GENIUS! I hope my 4 cupcakes are enough to put one of these puppies through school, or teach them to fish, or maybe get them innoculated against measles mumps and rubella. Love it! You are so clever!! how super cute are they! I've I had one I would make it lick my face....is that weird? I would start with his nose.....chomp! hehehe....I really want one now! These are too cute for words!!!! You are so clever...well done!! Simon - Haha thanks so much! I did jack up the price actually :D Ended up raising over $200! Karen - Thank you!! I'm so sorry none of them lasted the night :( But they probably wouldn't have tasted so good the next day cos of the cream cheese! Lisa - Aww thanks!! Haha not really a pioneer, sort of got inspiration from random decorating ideas on the internet, though we can thank gazebo for the fairy floss inspiration! Minh - :D thank you! I loved the hair but unfortunately by the next day it looked a bit matted! Oh well! Bean Sprout's Cafe - Haha thank you!! Betty - Haha yeah I think I pushed people a bit with the price tag! I got some incredulous looks when I said they were 4 bucks but I just kept saying "It's for a good cause!!" Belle - Haha yeah I'm not sure about that! it's sort of a random made up breed I think...The Steph breed! Thank you! Howard - Thanks!!! :) The hair was my fav bit but so fiddly to do! Yas - Heehee thanks I still ate one anyway! And thanks for all the twitter love too! lex - haha yes I seem to be doing way too many cupcakes recently hey? So sick of them now! Rebecca - :D thank you! Maria - LOL nahh that's not weird, I wish I had taken some photos of me doing that now! One of my workmates said his son only ate the nose and the eyes haha! Jen - :D Thanks so much! Hehe I hope that they were worth what people paid for them. Brena - Aww thank you so much! 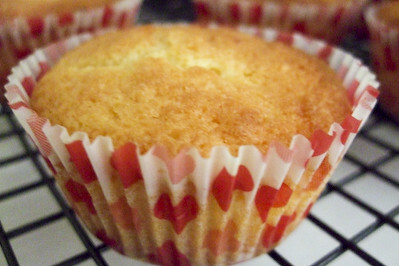 How do you make your cupcakes flat!?? You've outdone yourself. These are ridiculously cute! Almost too cute to eat! Great great job! I wish I had seen your post before I made my cupcakes. 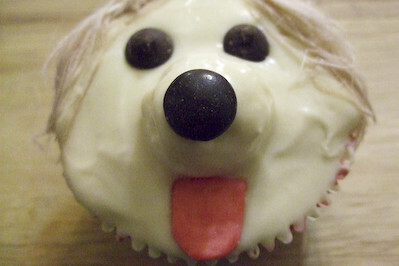 Next year I'll probably have a go at your pupcakes. Steph, these are JUST SO ADORABLE!! What a wonderful, creative idea. I would never have come up with something so unique! These are fantastic, I love their little tongues and hairstyles! Oh dear, now you have lots of non-brown m&ms that need to be eaten. What a shame. abbie - Ermm, they usually just come out flat! If they are rising too much in the middle it probably means your oven is too hot, esp if your oven is fan forced. Linda - Haha thank you! tissalicious - I contemplated doing a test run of the cakes so that I could post it up earlier but in the end I ran out of time :( Maybe next year! Julia - Aww thanks so much! Now that I don't believe, you would come up with something amazing for sure! 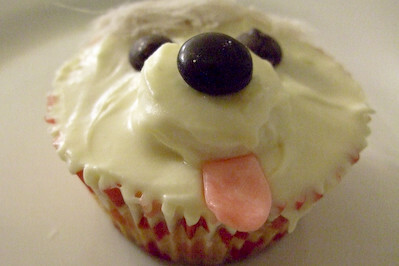 Your pupcakes are so cute!! You are so creative! How does the persian fairyfloss taste? Aww thanks :) That particular one is chocolate flavoured so it tastes like chocolate fluff :) It's a much lighter texture to regular fairy floss, I just love it!